BELLEVILLE, Ont. (07/06/2012) Mary Elizabeth Webster is congratulated by her two daughters after being named top student at Loyalist College during Thursday afternoon's convocation ceremony. Photo by Marc Venema. Belleville resident Mary Elizabeth Webster is the top student at Loyalist College this year. Webster, who moved to the Belleville area while in high school previously studied architecture, hotel management, and massage therapy, before starting at Loyalist College two years ago in the business program. 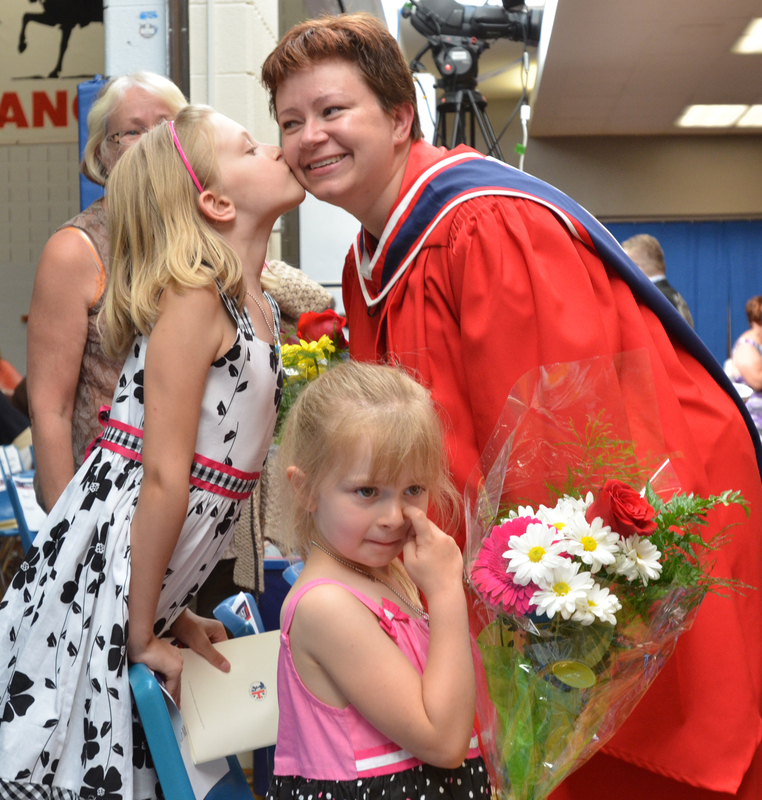 Webster was one of the almost 2,000 students who graduated from Loyalist College last week. Families and friends packed into the college’s gymnasium for four separate convocations last Thursday and Friday. Biotechnology technician student Jaymin Patel was one of the students who didn’t see family when he looked out into the crowd. A native of India, Patel’s family was unable to make it. Patel said while certain aspects of his future remain uncertain, one thing is clear. The graduates now join the more than 30,000 alumni of Loyalist College. Wright said as chair of the board, he’s accustomed to shaking lots of hands and posing for photo-ops throughout the community, but convocation stands out above the rest. On Thursday morning, the schools of architecture and building sciences, health sciences and skills training listened to a speech from guest speaker Jayson Mayers, president and CEO of Canadian Manufacturers and Exporters. Mayers told students to work hard and take all the skills they’ve acquired at Loyalist to stand out above others, like many Loyalist grads have done in the past. “I’m talking to people in business all the time and I know how dependent they are on people who are graduating from Loyalist College.” Mayers said in an interview. Rod McQueen spoke to graduates from the centre for justice studies and the school of business and management studies on Thursday afternoon. McQueen, a business journalist and author had a strong message for graduates. “Believe in yourself, take risks, put some changes into your life from time to time, don’t just follow a straight path,” McQueen said in an interview. McQueen said he and his wife took off on several occasions to travel to Europe. Webster hopes to be back up on the stage next year to defend her award for highest average of a graduating student. She has her sights set on the advanced diploma in the business program.